Professor Kevin Bales will discuss the most recent of his award-winning books on contemporary slavery. 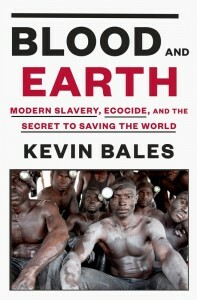 Blood and Earth: Modern Slavery, Ecocide, and the Secret to Saving the World (Random House – Jan. 19, 2016) by Dr. Kevin Bales. St. Paul, Minn. — Dr. Kevin Bales, widely regarded as the world’s leading expert on contemporary slavery, will discuss his just-published book, Blood and Earth: Modern Slavery, Ecocide and the Secret to Saving the World, from 4:45 to 6:15 p.m. Wednesday, Feb. 3, in the auditorium of O’Shaughnessy Educational Center on the St. Paul campus of the University of St. Thomas. The lecture is free and open to the public. Co-sponsors are St. Thomas’ Faculty Development Center, John A. Ryan Institute for Catholic Social Thought, Environmental Science Program, and the departments of History, Philosophy, Geography and Environmental Studies. Bales holds a Ph.D. from the London School of Economics and is professor of contemporary slavery at the Wilberforce Institute for the Study of Slavery and Emancipation at the University of Hull, England. His Blood and Earth, published with Random House, is the latest in series of a dozen books he has authored or co-authored about slavery throughout the world. Other books include Disposable People: New Slavery in the Global Economy (1999); Understanding Global Slavery (2005); Ending Slavery: How We Free Today’s Slaves (2007); and, with co-author Ron Soodalter, The Slave Next Door (2009). Bales went undercover to meet slaves and slaveholders for Disposable People, which was nominated for a Pulitzer and has been published in 11 languages. An HBO film based on one of his books, Slavery: A Global Investigation, won a Peabody and two Emmys. His Ending Slavery won the Grawemeyer Award for Ideas Promoting World Order and his work was named one of the top “100 World-Changing Discoveries” by the Association of British Universities. He is co-founder of the Washington, D.C.-based Free the Slaves, a sister organization to Anti-Slavery International, the world’s oldest human rights group that was founded in 1787. In fall 2015 Bales was a visiting professor at the University of Chicago. Currently he is working on a book about the relationship between slavery and forced marriages.